Can you believe it&apos;s been 10 years already! Thank you to all of our wonderful residents who&apos;ve helped make Haymeadow Apartments the "Best of the Best" in Peoria, IL! 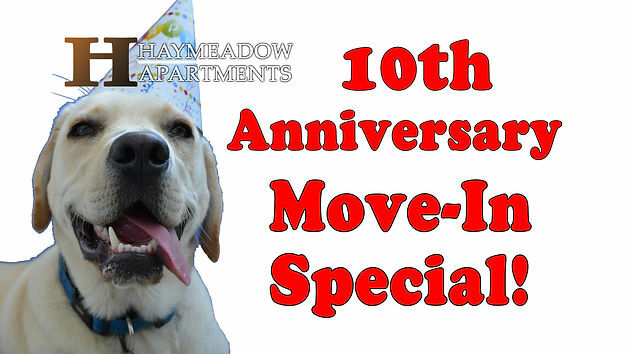 In celebration of our 10 years, we are offering a "sweetheart" of a deal on 1 and 2 Bedroom apartments! We&apos;d say we&apos;re rolling prices back to what they were 10 years ago, but THESE prices are even BETTER than they were 20 years ago! Please visit our Haymeadow page for more information, or just call us 309-692-7155 to schedule a visit today!